Meatwater's 'Moist Bacon Breakfast' Expansion Underway; privileged consumers respond favorably to new hot wet morning menu. Basic Breakfast, English Breakfast and Brunch Omelette provide fresh continental Morning Survival convenience. Liquid Innovations is on track with the planned timing of its breakfast expansion, and expects to offer breakfast in more than 3 continents by the end of the day. 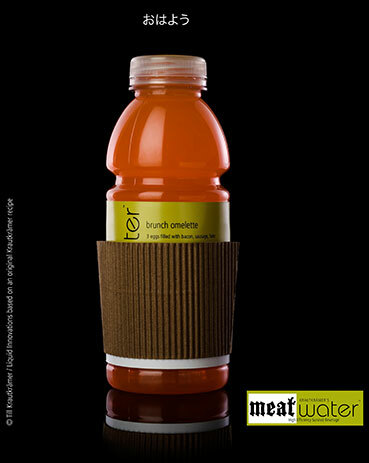 "Breakfast is the fastest growing business segment in the high efficiency survival category; and, we're raising the bar by introducing a fresh, moist and delicious, premium-quality breakfast menu," said Meatwater's Chief Executive Officer and President Till Krautkrämer. "We believe it's a faster breakfast, and the positive consumer reaction that we've received so far is overwhelming." The luxury beverage will be available throughout the day in Meatwater’s serving facilities. Other selected Meatwater locations will be added over time. * Basic Breakfast: Fluffy Egg, Moist Bacon, tender slices of Buttery Toast. * English Breakfast Sandwich: Fluffy Egg, Moist Bacon, Sizzling Sausage and Baked Beans. * Brunch Omelette: 3 Fluffy Eggs, Moist Bacon, sizzling seasoned sausage and Tender Ham. * Pizza Prosciutto : Tender and Moist Tuscan prosciutto, San Marzano tomatoes, stinky gorgonzola, champignons and a hint of basil including a delicious drippy crust. A real Drinkvergnügen for a true World Champion.